Since its introduction, the iconic Nissan GT-R has had one goal in mind – never rest on its laurels. One of the most acclaimed supercars in automotive history, the Nissan GT-R is the ultimate expression of the Nissan brand and its “Innovation for All” philosophy. A multi-dimensional performance machine that lives up to the concept of “the ultimate supercar that can be driven by anyone, anytime, anywhere,” the Nissan GT-R receives a number of engine and suspension refinements for the 2013 model year, all designed to enhance its already legendary performance. The major refinements to GT-R’s renowned engineering masterpiece of an engine include improved intake efficiency, reduced airflow resistance including an enlarged air intake duct for the intercooler, and improved exhaust emissions efficiency and enhanced control. The engine is hand-assembled in a special clean room, similar to racing powerplant construction. As a result, horsepower is rated at 545 hp, an increase of 15 hp over the 2012 GT-R’s 530 hp. Similarly, torque has been increased to 463 lb-ft from 448 lb-ft. Transmission shift feel and quietness have been refined through a strengthened design of the shift fork arm and a firmer fixing bearing for the flywheel housing. Also, high performance differential oil, used in GT-R motorsports competition, is now standard for production models. In addition, the suspension has been retuned and a handmade dry carbon rear spoiler has also been added to the Nissan GT-R Black Edition model. Other enhancements include the addition of a new blue lighting treatment inside the tachometer ring to match the shift position indicator light, helping provide a more sophisticated cockpit atmosphere. A RearView Monitor is now standard on all models. 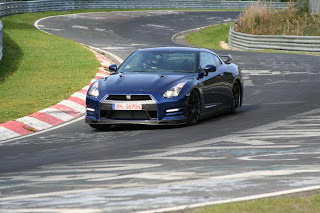 The 2013 Nissan GT-R is scheduled to go on sale at select certified Nissan dealers in January 2012. This is similar to how the Black Edition wing will look. Following a major revision just last year, the 2013 Nissan GT-R is offered in two models – GT-R Premium and the GT-R Black Edition with special lightweight black aluminum forged RAYS® wheels, unique read and black interior, Recaro® leather-appointed seats and new dry carbon fiber rear spoiler. The 2013 Nissan GT-R is once again anchored by an advanced 3.8-liter twin turbo V6 engine matched with a high-performance 6-speed dual-clutch transmission. Engine efficiency has been improved for the new model year, which helps raise horsepower to 545 hp (versus the previous 530 horsepower) and torque to 463 lb-ft (versus the previous 448 lb-ft). The engine is hand-assembled in a special clean room. GT-R is built on an exclusive Premium Midship platform, which enables the use of the world’s first independent rear transaxle ATTESA E-TS all-wheel drive system. This system places the transmission, transfer case and final drive at the rear of the vehicle, optimizing weight distribution and maximizing handling capability. 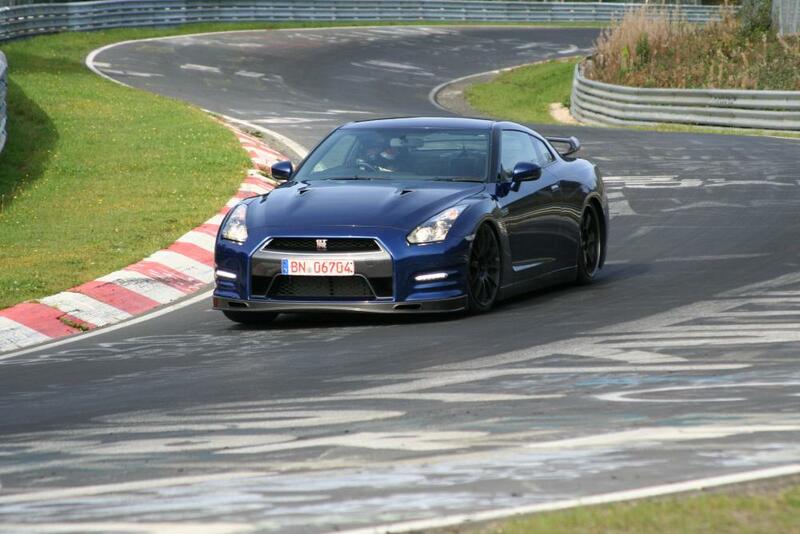 The Nissan GT-R suspension has been retuned for 2013. The vehicle again utilizes a special Bilstein DampTronic system, and the braking system consists of Brembo full-floating drilled rotors, low steel high stiffness brake pads and Brembo monoblock six-piston front and four-piston rear calipers. The 2013 Nissan GT-R’s lightweight 10-spoke forged aluminum 20-inch RAYS® wheels feature a premium dark (near black) finish, which provides a high quality, high-performance look. They are mounted with Dunlop Sports Max GT 600 DSST CTT tires – P255/40ZRF20 in front and P285/35ZRF20 in the rear. The Black Edition features special metallic black six-spoke RAYS® lightweight wheels with Dunlop Sports Max GT 600 DSST CTT tires – P255/40ZRF20 in front and P285/35ZRF20 in the rear. Nissan GT-R’s aerodynamics were improved last year with increased downforce and the coefficient of drag reduced to 0.26 (from 0.27). A new front fascia with aggressive double rectifier fins and integrated high intensity LED running lights was also added, enhancing the car’s strong visual presence. Other exterior features include high-mounted LED stoplights, bright LED rear combination taillights, “super wide beam” headlights, heated door mirrors and flat-blade windshield wipers. Six exterior colors are available for 2013: Deep Blue Pearl, Jet Black, Solid Red, Gun Metallic, Pearl White and a 4-stage metallic Super Silver. Inside, Nissan GT-R’s four-passenger cabin again balances functionality with a sense of ease and comfort. It features sculpted performance bucket seats for an optimal driving position, a cockpit-style instrument panel with a large center-mounted tachometer and multi-function display – which includes mechanical and driving information, as well as an on-board driving recorder, and carbon fiber trim. The Black Edition adds custom red and black Recaro® leather-appointed seats, red and black interior trim and a dark headliner. A specially designed 11-speaker Bose® sound system with speakers mounted in rigid aluminum die cast panels, which provides sound quality suitable for a supercar, is standard. Additional standard equipment for 2013 includes a RearView Monitor, Nissan Navigation System with XM NavTraffic® with Real-Time Traffic Information and NavWeather™ capabilities (XM® subscription required, sold separately), and Bluetooth® Hands-free Phone System. Safety equipment includes a Nissan Advanced Air Bag System for driver and front passenger, front seat-mounted side-impact supplemental air bags for driver and front-passenger and standard roof-mounted curtain side-impact supplemental air bags for front seat occupant head protection – along with front seat belts with pretensioners and load limiters and tension reducers, and three-point ELR/ALR rear seat belts. The 2013 Nissan GT-R is sold and serviced through nearly 700 Nissan dealers that have attained “GT-R Certification” status by meeting a number of strict sales, service and facilities commitments – including dedicating a master technician to GT-R service, special training for service managers and technicians, and designating dealer principals, executive managers and general managers as the primary communicators and negotiators in sales transactions. The names and locations of local GT-R Certified Nissan dealers are available on NissanUSA.com.